All product designs, product names and content included on this website are protected by international copyright and trademark laws. You are not permitted to use any product designs, product names or trademarks presented on this site without prior written consent from Normann Copenhagen ApS. This policy describes how we use and protect personal data and ensure that employees are familiar with the rules that apply to the use of the personal data that they can access as part of their work. This policy is a supplement to our other policies on IT security, internet, email and the like. This policy aims to meet the requirements of the General Data Protection Regulation (GDPR) and, in particular, article 13. When the policy refers to articles of law, this pertains to the GDPR, and when it refers to paragraphs, this pertains to the Danish Data Protection Act. All processing of personal data at our company is subject to the principles of lawfulness, fairness and transparency. Personal data is only collected for legitimate purposes which have been specifically indicated, and we comply with the data mining principle. We strive to ensure that all information is correct and up to date, and we prioritise the principles of storage limitation, integrity and confidentiality and, in particular, accountability. NORMANN COPENHAGEN APS is a data controller, and we make sure that your personal data is processed in accordance with legislation. There may be many reasons for processing personal data, but the following examples are the most common. We will inform you if, in exceptional cases, we process personal data for purposes that do not fall within the categories below. The same applies if we collect or process personal data from other persons than you. 4.1 What data do we collect? We have a number of digital solutions based on different technologies aimed at ensuring user-friendliness and security. These technologies can collect data automatically so as to offer the best possible solution, either directly by us or by a third party on our behalf. Analysis of clickstream data and cookies is an example of this. We use internal data providers that act as data processors for us. We are data controllers with respect to the collected data, and the collected data will not be passed on without consent unless required by law. We record information that you provide in connection with a physical visit or a visit to our website. Personal data is processed mainly pursuant to article 6.1.b, as processing is necessary in order to fulfil the contractual obligations between us. As much as possible, certain data, including sensitive data, is processed on the basis of consent, cf. directly below. We may pass on your data if this is required pursuant to a legal obligation. Transfer can also take place following an order from a court or other authority or to protect trademarks, rights or property. This involves exchanging information with other companies and organisations for the purpose of protecting against fraud. We use service providers and data processors that carry out work on our behalf. For example, the services could include server hosting and system maintenance, analysis, payment solutions, control of address and creditworthiness, email service, etc. These partners may gain access to data to the extent necessary to provide their services. Partners will be contractually obligated to process all data with strict confidentiality, and they are therefore not permitted to use data for purposes extending beyond their contractual obligations to us. We check that our partners are in compliance with their obligations with regard to data processing. If we pass on your data to a service provider or data processor outside the EU, we make sure that they are in compliance with the requirements imposed by legislation for such transfers. We never collect personal data that was not provided by you during registration, purchase, participation in a survey, etc. We save your data for as long as we have a legitimate and objective reason to do so, which includes being able to provide you with the best service possible. Generally, all personal data will be erased five years after the termination of the customer relationship, which is defined as the last active transaction. Personal data may be kept longer if there is an objective reason to do so, e.g. if a legal claim needs to be established, alleged or defended, cf. article 17.3.e. Cookies, however, are erased at the latest 12 months after use, cf. section 4. You have the right to have incorrect data about you corrected without undue delay. You must take the initiative for such rectification. You may also request erasure (“the right to be forgotten”), though only after the expiry of our legal obligation to keep the data pursuant to the Danish Bookkeeping Act. You can also contact us if you believe that your personal data is being processed in violation of legislation or other legal obligations. When you contact us with a request for rectification or erasure of your personal data, we will check to see that the conditions are met, and if this is the case, we will rectify or erase the information as quickly as possible. You have the right to receive the personal data that you have made available to us and data that we have collected about you from other players with your consent. If we process data about you as part of a contract to which you are a party, you can also receive your data. You also have the right to transfer this personal data to other service providers. We generally do not engage in profiling, i.e. automated decisions used in analyses and similar. When consent is necessary as a basis for processing data, we must be able to document that we received such consent. Therefore, we always require a written consent. Consent is a voluntary, specific, informed and unambiguous declaration concerning processing of personal data. You can always withdraw your consent, and if it is the only basis upon which processing is taking place, future processing will cease. Our obligation and right to store data will, however, be unaffected. The consent can be withdrawn by contacting us using the contact information specified in subsection 1. You can always opt out of receiving cookies on your computer by changing your browser settings. The location of these settings will depend on the browser you are using. However, you should be aware that if you do this, there will be many functions and services on the internet that you will not be able to use. All browsers allow you to delete cookies either collectively or individually. The way this is done depends on the type of browser you are using. Remember, if you use several browsers, you must delete cookies in all of them. We protect your personal data, and we have a set of internal rules on information and IT security. Our internal security rules include instructions and measures that protect your personal data from being destroyed, lost or changed, against unauthorised disclosure and against unauthorised parties becoming aware of or gaining access to it. In case of a security breach that exposes you to a high risk of discrimination, ID theft, financial loss, loss of reputation or other significant disadvantage, we will notify you of this security breach as quickly as possible. We are also subject to a mandatory duty of notification. Anyone is entitled to submit a complaint to the Danish Data Protection Agency concerning our processing of personal data. By accepting and consenting to receive newsletters from us, you are also accepting our terms for the Receipt of Newsletters, which you can find below. When you have subscribed to our newsletter, your email address will be used to issue newsletters that contain information on current knowledge as well as inspiration and ideas, relevant offers, seminars and events, tips & tricks and other marketing materials. We may also use your email address to send informational emails pertaining to our business. Beyond this, your email will not be used for other purposes. The data that we collect on your use of the newsletters will be anonymised and used to improve our service and our ability to target and adjust the content to the recipient’s interests. We issue our newsletter or other communications when we believe we have something interesting and new to tell you. We strive to limit the number of newsletters so that the content is relevant, current and does not clutter up your inbox. Your data will be stored and processed confidentially and securely. Our company, as well as the subcontractors we use, have implemented the necessary technical and organisational security measures to prevent that your data is misused, disclosed to unauthorised parties, accidentally or unlawfully destroyed, lost or impaired or processed in violation of the personal data legislation. Your email address will be kept for as long as you are subscribed to our newsletter. If you unsubscribe to the newsletter, we will delete your email address from our newsletter contact list. We may still have your data from other contexts. This will not be affected when you unsubscribe from the newsletter. We can therefore continue to process such data in accordance with other consent or authorisation that we have received. After unsubscribing from our newsletters, the statistical data on your use of the newsletter will be anonymised, without the possibility of later de-anonymisation. You can always unsubscribe from the newsletter by clicking the “unsubscribe from newsletter” link that you can find in all our newsletters. After unsubscribing from the newsletters, you will not receive anything else from us, unless you have consented to us contacting you in another context. When you unsubscribe, you will receive a confirmation that we are deleting you from our list of newsletter recipients. Your email address will then be deleted from our list of newsletter recipients. 1.1 Cookies are small data files that are stored on your computer’s hard disk, on your tablet or on your smart phone. Cookies contain data that the website uses to optimise communication between you and your browser. Cookies do not identify you as an individual user, but they do identify your computer. 1.4 A cookie may contain text, numbers or, for example, a date, but it does not contain personal data. A cookie is not a program and cannot contain viruses. 2.3 Before we place cookies on your device, we ask for your consent. In connection with this, you will be informed of the use and purpose of collecting data with cookies. 2.4 Necessary cookies for ensuring functionality and settings can, however, be used without your consent. Statistics, i.e. for measuring traffic, including the number of visitors at www.normann-copenhagen.com, which domains the visitors come from, which pages they visit at www.normann-copenhagen.com, and the geographic area of the visitors. Improve the functionality, i.e. improving the functionality and optimising your experience when visiting www.normann-copenhagen.com. Integrate with social media, i.e. allowing you to integrate with social media such as Facebook. Ensuring the quality of our service and preventing abuse and irregularities in connection with the use of our services. Displaying specific advertising at www.normann-copenhagen.com, which we believe would be relevant to you. 3.1.1 3.1.1 We provide access to our subcontractors to gain insight into the content of the cookies placed by www.normann-copenhagen.com. This information may, however, only be used on our behalf and may not be used for the third party’s own purposes. Google Analytics: We use Google Analytics for statistical and marketing purposes. Facebook: We use Facebook for statistical and marketing purposes. 3.4.1 You always have the option to delete cookies saved on your computer. 3.5.1 We use Google Analytics to analyse how users use www.normann-copenhagen.com. The personal data that the cookies collect on your use of the site (traffic data, including your IP address) is sent and saved on Google’s servers in USA: Google uses personal data to evaluate your use of www.normann-copenhagen.com, prepare reports on the activity at www.normann-copenhagen.com and offer other services in conjunction with the activity at www.normann-copenhagen.com and the use of the internet. Google may also pass on personal data to third parties if required by law or if the third party processes personal data on Google’s behalf. 3.5.2 Google Analytics uses two types of cookies: (a) A persistent cookie that shows if the user is a returning user, where the user comes from, which search engine was used, keywords, etc., and (b) session cookies, which are used to show when and for how long a user was on the site. Session cookies expire after each session, i.e. whenever you close the tab or shut down your browser. Google does not link your IP address to other personal data that Google possesses. 4.1 When we collect declarations of consent from visitors at www.normann-copenhagen.com, we use a module through which the user can also withdraw their consent. 4.2 If a declaration of consent is withdrawn, the data collection is halted and an automatic block is initiated. 4.3 Since cookies are actual files, they must be deleted manually from the device, either via the browser or using a program. Normann Copenhagen ApS strives, to the fullest extent possible, to provide accurate and updated content on this website. Unfortunately, there may occasionally be price changes, sold out goods and other unintentional errors on our site. We reserve the right not to be held liable for these errors or changes and neither Normann Copenhagen ApS, nor any employee or representative of Normann Copenhagen ApS can be held liable for damages arising from the use of this website or the products sold here. Any dispute arising between a customer and Normann Copenhagen ApS will be settled in accordance with the laws of Denmark. www.normann-copenhagen.com is open 24 hours a day. The website might temporarily be down for maintenance. You must be 18 years old, and have a valid credit card to shop on our website. If you are not yet 18 years old, you can have an adult make the order for you. 1. When you have selected the products you would like to order on the products pages, click “add to shopping bag”. In the shopping bag click on the “Proceed to checkout” button at the bottom of the page when desired products are in the shopping cart. 2. Continue through the checkout process, and fill in your details; name, shipping address etc. You can check the products and total amount during check out. Click “Proceed to order review” when you have filled in all the information. 4. At this stage your order is still subject to our acceptance. When we have accepted your order, we will obtain an authorization from your credit card company for the amount on the order. We are not withdrawing money from your card at this stage (made to order products will be withdrawn immediately to begin the production), but the amount might be reserved on your account. This is a normal process with banks and credit card companies. If your credit card is not authorized, your order will not be processed further. All prices are listed including Danish VAT. Payment is processed via Altapay through a Nets approved and PCI-certified payment solution. Altapay uses SSL-encryption in the communication with Nets. SSL is short for Secure Socket Layer and is a security protocol that ensures that data is encrypted in the communication between the customer, the Normann Copenhagen online shop and Altapay. It is therefore not possible for third parties to intercept any credit card information. Furthermore, Altapay is fully PCI certified. The purpose of the PCI standard is to have a common, international standard that defines a range of demands for storing, transmission and handling of credit card data – and how it should be ensured that the requirements are complied with. If your delivery country charges customs or import duties - these will be charged once the package reaches the destination country. You will have to pay these charges. This also applies to the purchase of gifts or other purchases made on behalf of another recipient. Unfortunately, we have no control over customs and import charges and we cannot inform you how much they will be before you order. Customs policies vary widely from country to country. Please contact your local customs office for further information. If you order for shipment outside of EU, the Danish VAT(25%) is automatically deducted in the shopping basket. Please note that local VAT and customs duties will apply upon receiving your package. Company order within the EU: If you have a valid VAT number, we can reimburse the Danish VAT(25%). Please pay the full amount upon checkout, and reply to the e-mail with the order confirmation, and send us your company VAT number. The amount for the VAT will be refunded to the credit card you paid with. We ship worldwide. The shipping charge depends on your delivery country and your purchase amount. Find your delivery zone below and see the shipping charges - as well as how much you need to order for to qualify for free shipping. If your items are in stock your order is normally shipped from our warehouse within 1-2 business days form receiving your order. Most of our shipments are handled by UPS. When your order is packed and on its way, you will receive an e-mail from UPS with a tracking number and an estimated date of the delivery. Sofas, large furniture and larger orders: We ship your order with special carrier, depending on the country of delivery. You will be contacted directly by email after you placed the order with more information about delivery time and dates. Please see below for estimated delivery times. Shipping time: Please note that the listed duration is only an estimated delivery time. Please allow 1-2 business days for packing. You will receive an e-mail from UPS with a tracking number and a more specific delivery date. Overseas, large orders are sent by ship and delivery time is 4-8 weeks. PLEASE NOTE THAT LOCAL CUSTOMS AND VAT WILL BE CHARGED WHEN SHIPPING OUTSIDE THE EU. 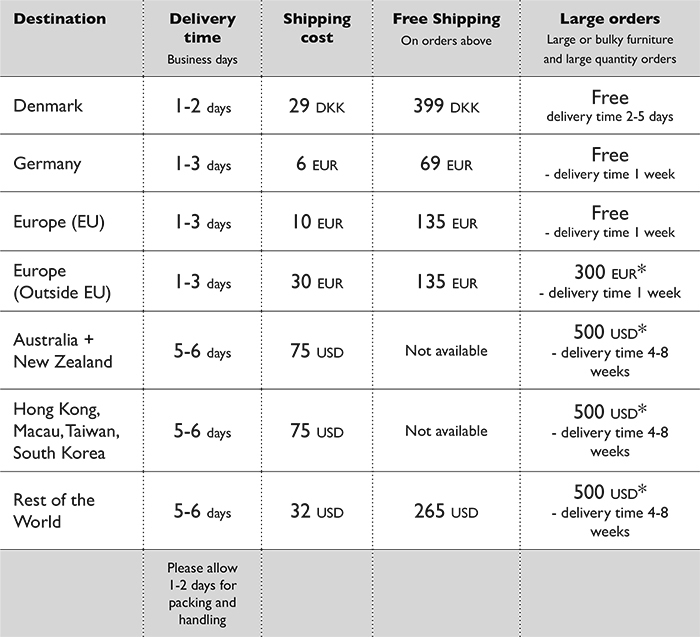 *For large or bulky orders shipped outside EU the shipping costs are only indicative. We will calculate the final shipping price after the order is placed and contact you prior to shipment if additional shipping costs will be applied to your order. You will have the opportunity to cancel the order at this stage of the order process. You can cancel your order if it has not yet been shipped from our warehouse. Normally orders are sent 1-2 business days after you place the order. Contact us and we will help you. If your order has been shipped from our warehouse you can not cancel your order. The order will be shipped to you, and you will have to handle it as normal return. Please see details in our return policy. Made to order products can not be cancelled. Once payment has been made for made to order products, the order and payment are legally binding, and the order cannot be cancelled for a refund. The made to order products are specially made according to your specifications of color, fabric and other style preferences. When ordering made to order products you accept that the payment for the order will be withdrawn directly after your order is received. This is done so the production of the product can be started immediately. You can change the shipping address on your order if it has not yet been shipped from our warehouse. Normally orders are sent 1-2 business days after you place the order. Contact us and we will help you. If your new shipping address has a different shipping fee, you will have to pay the difference. If your order has been sent from our warehouse you cannot change the shipping address or the contents on your order. The order will be sent to the original address, and you will have to handle it as normal return if you have changes. Please see details in our return policy. You may change your mind within 14 days of receiving your items. You have to notify us before the 14 days if you want to return your order. Please contact us at shop@normann-copenhagen.com if you want to return a product or use the return form. After you have received the items you ordered, you may carefully examine and try the items within the period of 14 days, but only in a manner as you would if you examined the products in our store or any other offline reseller. If the items or packing have been used in excess of what is normal in order to examine them, you will be held liable for the decrease in value of the items the use has caused. When we have received the items, we will notify you if there is any loss of value of the product and if your refund will be lower than the price paid. If we accept your return order as valid and the product can be re-sold as new, we will give you a full refund of the purchase price, including the original shipping charges for the items that you return to us. But we do not cover the return shipping cost. The refund will be paid back to the credit card (or method of payment) used to pay for the order within 14 days of receiving the notification of your wish to return the order. However the refund will not be paid before we have received the items at our warehouse. Some products cannot be returned. Products including food, for example our series of Tea, can not be returned. The shipping costs for returning an order are not covered by us, and must be paid by you, and must also be arranged by yourself. For larger orders we can arrange for the return, but the shipping charge is still to be paid by you, and is still your responsibility. The items you want to return are your responsibility until they reach our warehouse. Damage done while returning / shipping the product to our warehouse is your responsibility. Please make sure you pack the return safely to prevent any damage to the products or boxes, as this will affect the value of the product, and thus our possibility to resell the item. Make sure the product’s original packaging is intact. Please keep receipts and tracking numbers as proof of sending the items back. Please fill out the return form that came with your order. Send it along with the items you wish to return. You are welcome to return items bought online to our Flagship Store in Copenhagen. Regulations are the same as stated above. Normally you will get your refund directly in the store, however we reserve the right to have a period of 14 days to examine the product and set the value for the return payment. 1. Notify by email on shop@normann-copenhagen.com within 14 days after receiving your order that you want to return something. 5. You will receive your refund within 14 days after we receive the notification or the model withdrawal form. However the refund will not be paid before we have received the items at our warehouse or we have received documentation proving the items have been shipped. The return shipment cost must be paid by you, and is not covered by Normann Copenhagen ApS. Please see below for estimates on return shipping costs. You are entitled to give notice of defects for a period of 24 months. If something is wrong with the product, your claim should be sent to us as soon as possible from the time that you notice the problem. You can either have a new product sent, a discount or return the product for a refund. This will be decided from case to case. Accordingly, the provisions on defects in the Danish Sales Act apply. If you send back damaged or faulty items please fill out the return form that came with your order. Send it along with the items you wish to return. If we accept your return order as valid and the product can be re-sold as new, we will give you a full refund of the purchase price, including the original shipping charges for the items that you return to us. But we do not cover the return shipping cost. The refund will be paid back to the credit card (or method of payment) used to pay for the order within 14 days of receiving the notification of your wish to return the order. However we reserve the right to withhold the refund we have received and inspected the items at our warehouse. c. You have handled the items in other ways than you normally would in a store for examining the nature of the type of item and its features. d. The item you have returned is a product that is made to order, specially made according to your specifications of color, fabric and other style preferences. You can also contact Online Dispute Resolution provided by the European Commission. This is relevant for customers within the EU. You can file your complaint at http://ec.europa.eu/odr. When filing your complaint you must state our customer service email shop@normann-copenhagen.com.